"It would seem that the times have changed." Pioneer Entertainment (soon to be Geneon) takes a rare excursion into Ohji Hiroi's highly popular Sakura Wars franchise with this release of the 2001 feature, produced by Production I.G., the team behind Ghost in the Shell, Blood, and Patlabor WXIII: The Movie. Set in a steam-powered 1920s Japan, Sakura Wars tells the story of the girls of the covert Imperial Flower Fighting Division, who battle in their steam-powered fighting armor, to save city and country from the demons that threaten it, while under the guise of the Imperial Operetta Troupe. The film retains the character design work of Hidenori Matsuhara (Oh My Goddess! OVAs, Ah! My Goddess: The Motion Picture), responsible for the TV series, based on Kosuke Fujishima's (You're Under Arrest, Oh My Goddess!) original designs. For a while since their last victory over the demons threatening their city, things have been fairly quiet for the girls of the Imperial Flower Fighting Division. They have managed to gel as a team both on stage and off, and their performances at the Grand Imperial Theater continue to draw well. The calming has had its effect throughout Japan's defense force, with some divisions disbanded, while the success of the Flower Division has spurned a spinoff group in Paris. The expansion also means a new division in the States, with the former captain of the Stars Division, Lachette Altair, heading up the New York Defense Troop. As a training measure, she has returned to Tokyo, complete with her own Eisenkleid fighting machine, to join the Flower Division for first hand experience. While some are happy to see their friend again, others are not, and the team spirit the girls have worked so hard to achieve is threatened by this new and independent minded member. The world is changing, and with the Americans taking a more active role, Brent Furlong of the Douglas-Stewart company is in Japan demonstrating its unmanned Japhkiel as a replacement for the Flower Troup's Koubu, under the premise that girls shouldn't be defending the nation's capital. With a surprise attack by the Kouma, the first public unveiling of the Japhkiels is enough to persuade the higher ups that they may be a good idea, until a few people begin investigating their secret, only to disappear. The girls of the Flower Division also have their suspicions about what is happening, and who is really behind this shift in government policy, as the battle lines are drawn with the Flower Division's very existence on the line. For the most part, the script works well, allowing the various personalities in the cast a chance to show their stuff. The feature budget means that this is one slick looking film, with beautiful backgrounds and smooth animation, sweeping cinematography, and a very polished look. The character designs remain true to the other animated properties, but where this film differs greatly from the previous animated versions is that the mecha get a facelift through the use of computer-generated animation, which is used throughout. While some may differ in their opinion as to whether or not it should be used in anime, I think the use of CG for the Koubu worked extremely well, allowing the intricacy of the designs to show through in ways traditional animation simply couldn't match. Some of its use is strictly eye candy, such as the initial launching sequence, which really doesn't move the story along, but is filled with spectacular imagery. The battle sequences are equally impressive, highly choreographed affairs, bolstered by an effective and dynamic soundtrack. 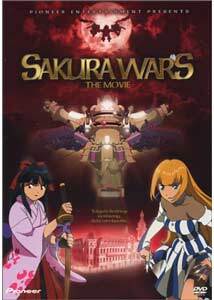 From an entertainment perspective, the film delivers the goods, but there are some issues that undermine its effectiveness, especially for those who are not familiar with the whole Sakura Wars universe, and as such, this will make the film appeal more to seasoned viewers. While the characters get enough screen time to establish their basic personalities, having the background from the OVAs and TV series helps a lot, and I'm sure that the additional exposure to the many video games—not available in North America—will greatly enhance the overall impression. The film also has a tendency to get off track in places, lingering too long on aspects that don't keep the story moving, including the finale, which, while fitting thematically with the opening, deflated the excitement that had been built up. Much of the character background, which could have been expanded on even slightly, is missing, making the significance of the appearance of characters like Lachette, or the absence of Ooghami for most of the film, unexplained. Still, as a one-off it succeeds, but like any piece of a larger franchise, will be most rewarding to those familiar with the rest of it. Image Transfer Review: Image quality is pretty much flawless in this stunning anamorphic transfer. The richness in the coloring comes across wonderfully, the CG and animation blending nicely. Detail is excellent, and jaggies or other typical anime problems are nonexistent. This looks simply gorgeous. Audio Transfer Review: The Japanese and English soundtracks are both presented in 5.1, and are very well crafted. There are plenty of dynamics and directionality, especially during the battle sequences, building an enveloping atmosphere. Dialogue is clear, yet works with the ambience of the room. A great presentation. Extras Review: Pioneer has         added a reasonable amount of supplemental material including two theatrical trailers, a pair of video conference reels (each running a little over three minutes), plus three 15-second TV commercials. Three art galleries are provided, including a 48-image character gallery, a 17-image mecha presentation and 31 images covering some of the backgrounds used in the film. Previews for Last Exile, Cardcaptor Sakura: The Move 2: The Sealed Card, Patlabor WXIII: The Movie, Mao-Chan, L/R and Armitage III are also included. Packaging includes a reversable cover with the original Japanese DVD art on the reverse, and an additional booklet, which I can't comment on, as we didn't receive one with our review copy. Both a regular edition and premium version with an added collection of pencil boards are available. Sakura Wars: The Movie takes the well known characters of the franchise, and gives them this feature presentation, with an updated look, and great production values. There is abundant action, and a story rich in subplots and intrigue, making for an entertaining stand alone piece. Like any long running series, those with a knowledge of the characters and back stories through the other properties in the series will get more out of it, but this stylish entry still comes highly recommended for those new to the show.